Manhattan - Damnatio Memorai - Review: "The Best Show You're (Probably) Not Watching"
One of the best shows to come out of last year is the criminally under-viewed series Manhattan, WGN America's second scripted series after the period horror drama about witches, Salem. 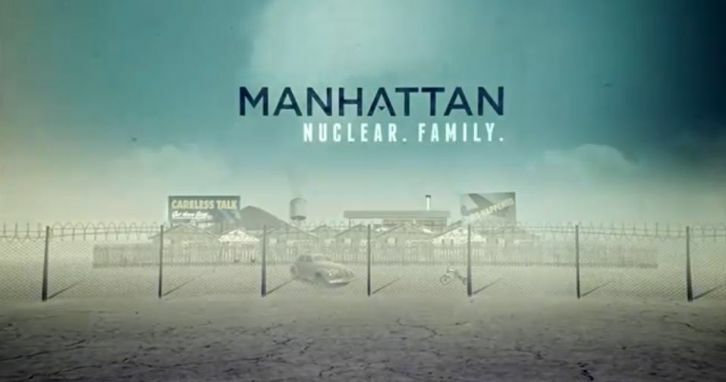 Manhattan was a far superior show (although that doesn’t mean that Salem is bad, it was quite watchable), and as a result, it's great to have it back, especially when you consider that the series has returned quite possibly even better than before, with "Damnatio Memorai" serving up one of the strongest episodes of the show to date as the new season began with Charlie Isaacs thrust into a leadership role, following Frank Winter's downfall in the previous season. The premiere opens with a strong, attention grabbing flash-forward that throws the audience right into the thick of things with a focus on July 16, 1945, which is, for all those unaware, the first time an atomic bomb was tested, and heralded the start of the atomic age. We don't see the bomb going off in the premiere but the ominous opener reminded us of what's in store over the season to come. The show itself is presenting us with an endgame, something which has been hanging over the series since the start, but now giving the audience a bit more forward progression, and it'll be very interesting to see what happens when we get there. But for now, we, much like the characters involved, have a lot of new things to experience before we reach that point. The main thing that the premiere addressed was the distinct lack of Frank Winter. He isn't even in it at all, but his absence plays a major role and affects multiple players in Los Alamos, with Charlie and Liza being the obvious characters affected. If you think back to Season 1, Charlie and Frank were rivals all throughout the first season, with the main conflict of the show focusing on these two characters not getting along. Now that Frank's gone though we find ourselves in need of a new way to keep the tension high, and in steps Col. Darrow from the Military, who looks to be a new thorn in the side of pretty much everyone at the base. I didn't watch CSI myself so am not particularly familiar with who he plays there, but fans of the series will be familiar with William Petersen, who strikes an imposing figure as a force to be reckoned with in the season to come, especially if you take in the fact that another major antagonist was killed off in the premiere (more on that later), as well as Frank's absence ending the established conflict between him and Charlie, at least for the foreseeable future The power of the military is a threatening one and here in Los Alamos, it's very clear that whatever they say, goes. The episode thrust Charlie to the forefront and saw him cope when under fire, presented with the new challenge of leadership. Whilst Charlie has knowledge he doesn't really have ambition, and Oppenheimer used this to his advantage to put someone at the post he believes he can control. Oppenheimer of course, is one of of the characters who was actually real, and you'll probably recognise his name from the quote "Now, I am become Death, the destroyer of worlds", as the show continues to draw from the rich history, using the real place of Los Alamos as a backdrop. Oppenheimer is portrayed as a sinister character here, and he could be stepping into Frank's role as the one who Charlie will be butting heads with, giving us some further potential for yet more conflict in the rest of the season. Going back to the death that I mentioned earlier, one of the biggest surprise moments came in quick succession. Meeks was discovered to be selling secrets to the Soviets, having been caught in the wrong place at the wrong time by none other than Mr. Fischer, who presented an unexpected opportunity for Meeks to get his hands dirty, and as a result, the Government man met his end, after casting his own shadow over the whole of Season 1. With new antagonists in the frame we don't really have a great need for the interrogator here, so this allowed for a nice, effective twist that left a powerful impact, and you have to start wondering whether all the characters here will make it to the end of Season 2 in one piece. Obviously we've seen a few in the flash-forward and Frank's survival was hinted at, but there are a few here and there whose fate we're not quite sure about yet. We also got plenty of time between two of the strongest female characters on the series, Abby and Helen. They got a strong scene together, and the interesting dilemma that came on the verge of Abby and Charlie's divorce was the fact that Abby happens to be pregnant. This is no doubt going to cause problems for the married couple, and Charlie's reaction sparks an conflicting dilemma, because he doesn't want to leave his future offspring growing up without a daughter. How this develops will no doubt present more problems for the characters to overcome, particularly when Charlie only learned of Abby's pregnancy through Mr. Fischer. And again dealing more on the characters personal lives was the relationship between Dunleavy and Callie, who was ushered back to the base at Dunleavy's incentive because he wanted to keep Callie with him when she was about to leave with Liza. This didn't work too well for Dunleavy when Liza worked out a way to get Callie off the compound. This again raises interesting questions that will be presumably answered further down the line, namely concerning what Dunleavy will do next, and whether or not Callie will stay away for good. Time will tell. "Damnatio Memorai" (Google tells me that it's Latin for a "Condemnation of Memory", in case anyone's wondering what it means), was an excellent way to begin Season 2 of Manhattan and it's fantastic to have this show back on air. And now that I'm done until next week (I'll also be covering HBO's The Knick, if you're interested, look out for a review of the premiere over the weekend), it's over to you. What did you think of the episode in general? Are you excited to have this show back? Will we see Frank Winter again? Let me know your thoughts and predictions of Season 2 so far in the comments below! +Charlie thrust into a new leadership role. +Using real events and characters well! +The flashfoward, teasing what's in store. +What happened to Frank Winter? +Meeks is a spy! Mr. Fischer dead! Manhattan continues at 9pm next Tuesday on WGN America. Milo is an Arsenal FC supporter and loves TV shows like Battlestar Galactica, Justified, The 100, The Americans and Person of Interest. He reviews Black Sails, Childhoods End, Da Vinci's Demons, Hell on Wheels, The Knick, Manhattan, Murder in the First, Narcos and Veep for Spoiler TV as well as books, films and games for his own blog The Fictional Hangout and contributes to comic reviews on a weekly basis for All-Comic.